Our consultants have conducted detailed site investigations and inspections to resolve numerous issues regarding indoor air quality throughout the UK. 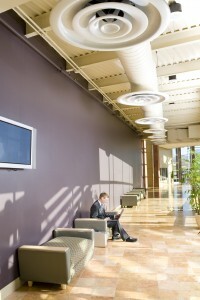 So why should you monitor the indoor air quality of your workplace? 1) The provision of evidence that the actual conditions of indoor air quality are suitable and pose little risk to occupant health or safety. 2) Monitoring the adequacy of the HVAC plant maintenance and servicing programme. Ensuring tasks are being completed as contractually agreed. 3) Indoor air monitoring allows timely identification of any pressing or escalating environmental problems or issues that may have a negative impact on the indoor air quality or may have gone un-notificed without such monitoring. 4) Allow the responsible persons to evidence that the indoor air and environmental conditions are improving, have deteriorating or are indeed maintained at a constant. 5) Routine indoor air quality monitoring programmes instil a level of confidence in staff members which boosts morale and supports the maintenance of healthy and productive working environment. 6) It is a well known fact that good indoor air quality can improve productivity substantially. Routine indoor air quality testing and monitoring programmes also provide tangible evidence that the well-being of occupants is taken seriously and respected. Whether you require office air quality testing or general indoor air quality monitoring in your home or office environment we can provide you with the expert service needed. 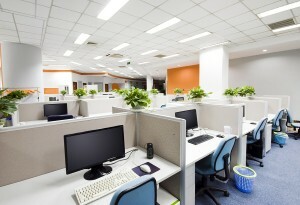 Good indoor air quality will enhance any office environment. However, poor indoor air quality can lead to a range of issues that should be avoided and indeed can lead to major escalations. Problems including recurring illness and increased absenteeism can effect an Organisations productivity greatly. Furthermore, failure to demonstrate effort towards resolution only resolves to elevated stress and tension levels between site occupants , managers and facilities personnel in most cases. Observation of potential sources of airborne chemical contamination (e.g. engines, chemical processes, neighboring facilities, construction etc). Inspection of layout and distribution of air supplies to the occupied spaces. Inspection of the condition of the HVAC systems and accessible components, such as filters, condensate drip trays, heating and cooling coils, air intakes, air supply and return grilles and accessible duct work etc. Observation for evidence of water ingress, excessive moisture or microbial growth. Contamination sources near HVAC and air intakes and returns. Temperature, relative humidity, carbon monoxide, carbon dioxide, nitrogen dioxide, sulphur dioxide, hydrogen sulphide, formaldehyde, airborne bacteria, fungi, yeast and moulds, airborne particles and air movement tests. Results are measured against current standards, regulations and guidelines. A formally written report is then produce to confirm whether the indoor air quality testing and assessment of the occupied space indicates a requirement for improvement or whether there is any significant risk to occupant health or safety. However, if needed we can go that step further and conduct very specific VOC analysis, gas analysis and duct work deposit thickness testing etc as required.